Dr Femi Akinsanmi is an applied Plant Pathologist. 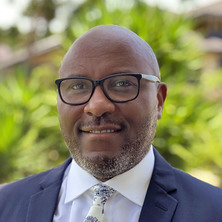 Femi’s research approach incorporates modern research tools relating to plant disease epidemiology, host genetics, pathogen taxonomy and decision support systems, to inform disease management systems in agricultural ecosystems. Femi’s experience extends from tertiary teaching, to consulting plant industries and research on diseases of soybeans, wheat, and horticultural crops including macadamia and apples, in both developing and developed countries. His service and industry engagement activities undergird the delivery of integrated disease management strategy, with significant benefits to all stakeholders. His current research activities is on diseases of tree nuts, with a major focus on macadamia. Fungicide resistance generally emerges through mutations in the nuclear or mitochondrial genome. High risk fungicides are used to control several macadamia pathogens, therefore, development of fungicide resistant strains is a major threat to effective disease control. There is a dearth of information on fungicide resistance in the macadamia ecosystems. The study will include detection and diagnostics of fungicide resistant strains in major fungal pathogens in the Australian macadamia industry. The scholar will utilise various traditional plant pathology and molecular tools to understand the nature and risk of resistance in novel macadamia pathogen and at risk organisms such as Botrytis species, to QoI (group 7), SDHI (group 11) and DMI (group 3) fungicides. This study will examine the pathogen biology of Diaporthe/Phomopsis and Colletotrichum species, associated with husk rot in macadamia. Information on epidemiological factors, infection process and mechanism of host resistance is required to develop forecasting models to manage the disease in macadamia cropping system. This study will include field and laboratory studies to elucidate the epidemiology of the diseases associated with Botryosphaeriales in macadamia. The candidate will examine the timing of infection, conditions necessary for infection and disease development and eluciate the nature of the pathogenic-endophytic relationship of the fungi. Akinsanmi, Oluyemi, Akinsanmi, Olufemi A., Adebisi, O. and Olumakaiye, M.F. Junior secondary agricultural science (UBE edition). Lagos, Nigeria: LearnAfrica, 2013. Parthenium hysterophorus L. (Asteraceae) invasion had limited impact on major soil nutrients and enzyme activity: Is the null effect real or reflects data insensitivity? Akinsanmi, Femi (2017) Fungi implicated in dry flower disease. Australian Macadamia Society Ltd. News Bulletin, 45 3: 67-67. Akinsanmi, Femi and Searle, Chris (2016) Branch dieback: a growing threat. Australian Macadamia Society News Bulletin, 44 1: 58-59. Akinsanmi, Olufemi A. (2015) Diseases affecting macadamia flowers: a significant threat to production. Australian Macadamia Society Ltd. News Bulletin, 43 2: 68-70. Metcalf, Dean, Bright, Jeremy, McLean, Steve, Akinsanmi, Olufemi and Commens, Robbie (2014) Biological control of husk spot in macadamia. Australian Macadamia Society Ltd. News Bulletin, 42 3: 56-57. Akinsanmi, Olufemi A. (2011) Husk spot management information sheet. Australian Macadamia Society Ltd. News Bulletin, 39 2: 18-19. Akinsanmi, O. (2018). Flower blights of macadamia caused by Botrytis cinerea, Pestalotiopsis macadamiae and Neopestalotiopsis macadamiae in Australia. In: International Congress of Plant Pathology (ICPP) 2018, Boston MA, United States, (S1.202). July 29-3 August 2018. Wrona, Christopher and Akinsanmi, Olufemi A. (2017). Characterisation of Diaporthe species causing husk rot in macadamia. In: Science Protecting Plant Health - a joint Conference of the Australasian Plant Pathology Society Conference and the Plant Biosecurity Cooperative Research Centre, Brisbane, Australia, (). 26-28 September 2017. Akinsanmi, Olufemi A. (2015). Advances and search for robust biological fertility indicators for sustainable soil health management in Perennial tree crops. In: TropAg2015, Brisbane, Australia, (). 16-18 November 2015. Akinsanmi O. A. (2015). Macadamia flower blight caused by a complex of pathogens: a redefinition of disease name. In: 7th International Macadamia symposium, Kruger National Park, South Africa, (). 10 -13 August 2015. Chakraborty, S., Scott, J. B., Akinsanmi, O. A., Liu, C. J., Mitter, V. and Dill-Macky, R. (2006). Fusarium pathogens of wheat in Australia. In: T. Ban, J.M. Lewis and E.E. Phipps, The Global Fusarium Initiative for International Collaboration. A Strategic Planning Workshop held at CIMMYT, El Batán, Mexico, (42-44). 14 - 17 March 2006. Scott, J., Akinsanmi, Olufemi A., Mitter, V. and Chakraborty, S. (2005). Gene genealogy of Fusarium pseudograminearum. In: 15th Biennial Australasian Plant Pathology Society Conference, Geelong, Australia, (363). 26-29 September 2005. Akinsanmi, Olufemi A., Simpfendorfer, S., Backhouse, D. and Chakraborty, S. (2005). Pathogenicity and variation in Fusarium spp. causing scab of wheat in Australia. In: 15th Biennial Australasian Plant Pathology Society Conference, Geelong, Australia, (380). 26-29 September, 2005. Chakraborty, S., Akinsanmi, Olufemi A., Mitter, V. and Liu, C. (2004). Fusarium species that cause head scab and crown rot of wheat in Australia. In: 2004 National Conference Australian Society for Microbiology, Melbourne Convention Centre Melbourne Australia, (). 26 September –1 October 2004. Scott, J., Akinsanmi, Olufemi A., Mitter, V., Simpfendorfer, S. and Chakraborty, S. (2004). Prevalence of Fusarium crown rot pathogens of wheat in southern Queensland and northern New South Wales. In: 4th International Crop Science Congress, Brisbane, QLD, Australia, (180). 26 September-1 October 2004. Akinsanmi, O. A., Mitter, V., Simpfendorfer, S., Backhouse, D., Yates, D. and Chakraborty, S. (2003). A comparison of Fusarium pseudograminearum and F. graminearum from wheat in Australia. In: Susan M. Canty, Janet Lewis and Richard W. Ward, 2003 National Fusarium Head Blight Forum Proceedings. National Fusarium Head Blight Forum, Bloomington, MN, USA, (120). 13-15 December 2003. Chakraborty, S., Mitter, V., Akinsanmi, O., Liu, C. and Francl, L. (2003). Epidemiology of fusarium head blight and crown rot of wheat: lessons for Australia. In: Susan M. Canty, Janet Lewis and Richard W. Ward, 2003 National Fusarium Head Blight Forum Proceedings. National Fusarium Head Blight Forum, Bloomington, MN, USA, (124). 13-15 December 2003. Mitter, V., Akinsanmi, O. A., Simpfendorfer, S., Backhouse, D., Yates, D. and Chakraborty, S. (2003). Fusarium - a serious threat to the Australian wheat industry. In: Randy, Clear, 3rd Canadian Workshop on Fusarium Head Blight, Winnipeg, Manitoba, Canada, (217-217). 9 - 12 December 2003. Akinsanmi, Olufemi A., Mitter, V., Simpfendorfer, S., Backhouse, D., Yates, D. and Chakraborty, S. (2003). Genetic and pathogenic diversity of Fusarium pseudograminearum and F. graminearum causing head blight of wheat in Australia. In: Annual Meeting of the American-Phytopathological-Society (APS), Charlotte, NC, United States, (S3). 9-13 August 2003. Akinsanmi, O., Mitter, V., Simpfendorfer, S. and Chakraborty, S. (2002). Fusarium spp. causing wheat head blight and crown rot in Australia. In: Annual Meeting of the American Phytopathologica Society, Milwaukee, WI, U.S.A., (S2-S3). 27-31 July 2002. Akinsanmi, Olufemi Akinyemi. (2004). Etiology and diversity of Fusarium species causing head blight of wheat in Australia PhD Thesis, School of Integrative Biology, The University of Queensland.